Sheila Goffe, Vice President AKC Government Relations, provides us with specific, actionable projects to impact the world around us. Ensure your all breed and parent clubs have Legislative Liaisons – and that your LL’s information is up-to-date with AKC GR. A Legislative Liaison is one of your club’s most essential links to AKC GR. AKC GR provides important legislative alerts and communications to our liaisons via e-mail, and asks them to in turn share it with their club members. Timely alerts provide notifications of proposals up for consideration, and information on how we can work together to protect your rights. Getting the word out quickly to local dog owners is essential to fighting bad legislation. Learn more about our Legislative Liaison program. Get involved and be a positive resource for canine expertise in your community. Join community groups, a political party or similar organizations. Don’t forget that all-breed clubs are also intended to be a resource for the community! Introduce yourself in person, in social media and in writing to local leaders and offer to serve as an expert resource. Whenever you speak with someone on this topic, always follow up. Follow up takes only a minute: a phone call, email, or social media contact. Wherever possible, provide more information of interest that will remind your contacts of the expertise you have to offer. (A link to AKC’s resources on the Economic Benefits of Dog Shows or the impact of dog shows by state and similar expertise can go a long way toward demonstrating your expertise). Be proud of the great work you do as a breeder/exhibitor/club member and share the love of dogs and your breed with others. A positive approach can be contagious. Attend town hall meetings with political leaders and bring a positive face to exhibitors and breeders. Know, understand and obey the laws governing dogs that apply to you. Do they need changing? We can help you with that. Share information about the good things you, your club and AKC does for the community. Do you teach classes? Provide therapy dogs? Donate to the local shelter? Participate in microchip or health clinics? Compile a list of the good things your club and club members do in the community and be proud to share that information (for examples, see AKC Above and Beyond.) 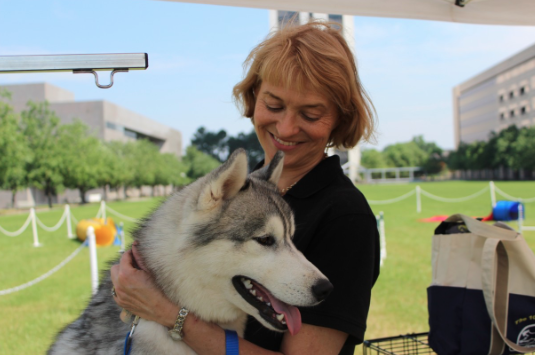 Developing positive relationships with leaders in your community shows them that people who show, breed dogs or own multiple dogs are an asset to the community. When you become an approachable expert resource, you will likely learn about and have opportunities to weigh in on canine proposals before they become a problem. AKC GR is always available to help you with this. Tips for getting involved and informational resources are available on the GR Toolbox at www.akcgr.org. Take advantage of AKC resources to provide educational opportunities in your community. September is Responsible Dog Ownership Month. Is your club holding an event for the public? Even if they aren’t, AKC resources make it easy for you to take important and meaningful actions, such as: inviting local leaders to your dog shows and events, inviting a local official or your local animal control professional to speak at a club meeting, and awarding a legislator of the year or dog friendly community award to leaders and communities that already show they care about responsible dog owners and respect the purebred dog tradition. See www.akc.org/government-relations or akcgr.org for more information about available awards, micro grants for educational activities and other ways AKC can help you get involved in your community. The Key Issues section of akcgr.org provides succinct information on some of the most common legislative issues that threaten the fancy, purebred dog ownership and breeding. AKC GR Blogs provide details and commentary on some of these issues. ALWAYS call, send an email, or attend a hearing if you receive an AKC legislative alert. AKC GR’s targeted alerts are distributed only to communities directly impacted by issues, and we rely on legislative liaisons to help deliver those alerts. AKC GR provides sample letters and step-by-step information to make this process easy. Always be respectful and professional in your communications. If you get a personal response from a legislator, we’d love to hear about it. More tips and instructions for communicating with legislators is available online and in these guides: Communicating Effectively with Legislators, Make Your Contact Count. Our job is to be a resource for you! Please don’t hesitate to contact us directly at 919-816-3720 or doglaw@akc.org if you have any questions or need assistance on a legislative/public policy issue.